Where have my bickering siblings gone? 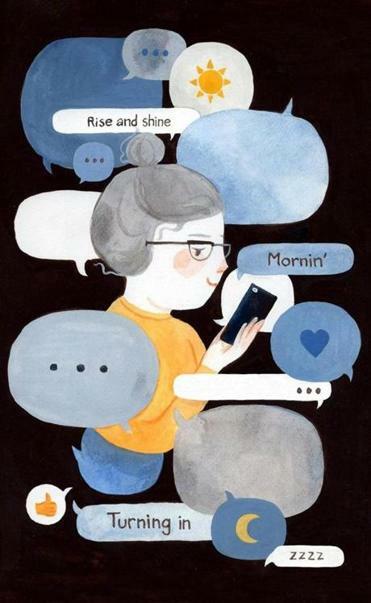 As we age, daily check-ins just feel natural. After all, that’s what Mom would want. My brother and I call each other twice every day, once in the morning and once in the evening, to confirm our existence. After all, anything can happen any day to sixty- and seventysomethings, and we know it. My sisters and I text each other almost every day, usually twice. After all, things can happen. We three girls are just a little more casual about it for some reason, and no one blows a gasket if we miss a check-in here or there. We know the lapse won’t last long. This started a couple of years ago, when I moved back to Massachusetts after three-plus decades out West. I’m here now to be physically closer to my siblings as we age, and because I love it here and always meant to come back home. Oddly, now that I’m in the neighborhood, so to speak, we are in more consistent contact via phone and text than when I lived far away without the chance to see my siblings very much. We always kept in touch, but not every day, certainly not twice every day, certainly not among all of us twice every day. It began after I mentioned in a voice mail to my brother, the family worrier, that I was looking forward to shoveling the day’s new snow. A few hours later, when I didn’t answer his return call, he decided that I was facedown in a snowbank or had been abducted by a snowplow driver. He called me repeatedly and then rang up everyone else in the family, who in turn called and texted me. My cellphone was inside bouncing on the counter with notifications while I was leaning on my shovel chatting with my new neighbors. After that, we devised our system of daily check-ins. These are mostly short hits separate from other calls and conversations. They’re quick, coded exchanges — “Mornin’,” “Off and running,” “Rise and shine,” “Turning in,” “Nite now,” or “Zzzzzz” — that translate to “present and accounted for.” It’s fast, easy, and reassuring to know that we’re all good, or at least good enough, for now. I wanted this, yet sometimes I chafed. I had been a single empty nester for years, coming and going at will without telling anybody. While twice-daily check-ins were a comfort, there was a tinge of being under surveillance or having a curfew, as if I couldn’t be trusted. Having championed the idea of being accountable and counted, I sometimes felt . . . watched. Of course I was being watched, and I was also watching. Not because we don’t trust each other, but because Mom said to. When we were kids, fractious, squabbling, and bickering, our mother insisted that we should love each other, that while friends might come and go, we would always have our brother and sisters. We weren’t buying it then. Her words fell on hard adolescent ground. But we grew up and got over ourselves enough that her meaning sprouted. We developed some high school and college-age camaraderie, probably helped along by being away from one another for semesters at a time. Then some young adult cohesion took hold, and eventually an adult appreciation of our connectedness jelled. For years now, we’ve pondered our good fortune in having had a mother who taught us to value and enjoy one another. We’re puzzled and saddened by other sets of siblings we know who are distant or unconnected. What a loss, we say. What a waste. No one in the world has known any of us longer than we’ve known one another. That’s something. We don’t always click, and our differences are real, but so is our bond. I will confess that sometimes I’m still momentarily bothered by making or getting a call or by hearing the insistent beep of an incoming text. But twice a day, we all know that we’re present and accounted for. We are watching and being watched for the best of reasons. Rosemary McCarthy is a community college tutor in Worcester. Send comments to connections @globe.com. Get the best of the magazine’s award-winning stories and features right in your e-mail inbox every Sunday. Sign up here.